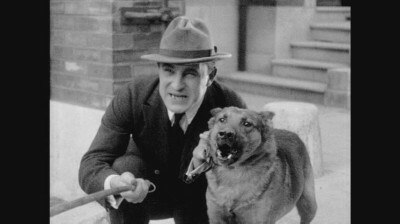 I love silent film and really like serials too, so when a silent serial (of which there are very few that still exist in their complete state) is released, I get really excited. 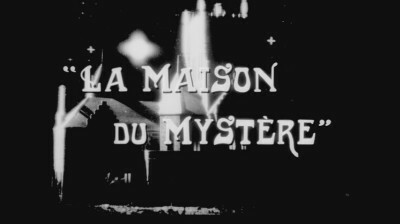 So it's natural that I'd have be eager to screen The House of Mystery, a 10-part, six and a half hour serial released in 1923 from France's Albatros Productions that has just made its way to DVD thanks to Blackhawk Films and Flicker Alley. As high as my expectations were, they were surpassed by this excellent series that is filled with drama, action, and some impressive filmmaking. Regine (Helene Darly) is the adult daughter of factory owners and lives on their elegant estate. 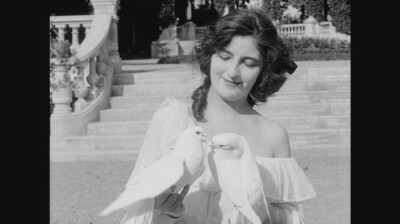 She is in love with her boyfriend, Julien (the wonderful Ivan Mosjoukine), and is excited when he proposes marriage and instantly accepts. The magnificently evil Corradin (a man so mean he throws a puppy (who is unharmed) in one chapter and played by Charels Vanel), Regine's childhood friend and the manager of her family's factory, is heartbroken when he hears the news. He has been enamored with the attractive young lady for years, but has never told her so. As soon as she's married however, he starts sowing the seeds of doubt into Julien's head making him question how loyal his wife actually is. With this simple act things go from bad to worse for poor Julien and soon he has much more dire things to worry about than if his wife is unfaithful, like staying alive and a step ahead of the law. This serial is not like the sound serials that had their heyday in the 30's and 40's, and is also quite different from the other silent series that have made their way to home video. Just about all of the serials that come to mind when someone mentions the term prioritize action over plot in a big way. The first chapter sets up the story, the middle chapters have the hero battling the villain again and again with each victory being met with a similar defeat or plot twist, and then everything is wrapped up in the final installment. The House of Mystery doesn't follow that formula. Instead of telling a short story and padding it out to ten chapters, it tells a long story and splits it up into ten parts. In a lot of ways it feels more like a TV miniseries from the 70's than a serial from the 30's. The story doesn't take place over the span of days or weeks, but rather decades. It's the saga of a family and the troubles that they encounter. This larger time scale gives the serial a grander feel. It's not interested in rushing from fight to chase to explosion; rather it takes the time to let the plot unfold. That's not to say this serial doesn't have any action... it does. There are some great chases and inventive stunts, which are some of the highlights of the show. There is a prison break followed by an epic chase, an impressive bridge over a chasm that is built with rope and humans, a fire, and much more. It just doesn't throw in a fist fight in every installment. It is a lot a fun. The action and heartfelt drama make this a very good serial, but what makes it fantastic is the impressive cinematography. The director, Alexandre Volkoff, wasn't afraid to try new things and the results are amazing and artistic. He plays with different ways to fill the frame, composing a long shot and having people walk up to the camera rather than cutting for a close-up. There is also a beautiful scene where a murder is show on the lens of a camera pointed at the event. The most impressive sequence for my money is the wedding in the first chapter. 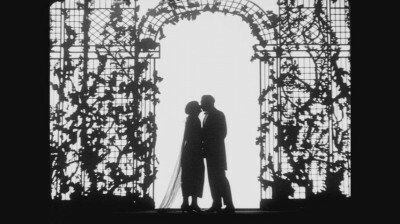 The entire event, from the guests arriving to the ceremony itself, dinner afterwards and a lavish party with a band, is shown in silhouette. The technique worked wonderfully and Volkoff used it to show the quick passage of time as well as the reactions of some of the guests. It's a very brave and astounding section. Flicker Alley has released this 10-chapter serial in a region-free 3-DVD set... The discs are housed in a single-width triple case that also contains a nice booklet about the film. 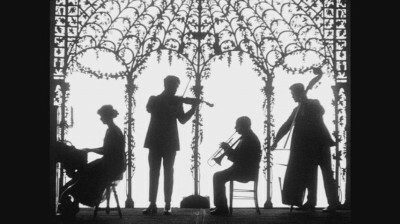 This silent serial comes with a piano soundtrack composed and performed by Neil Brand and it is wonderful. The dramatic music he wrote is somber but not overly so, but the soundtrack really shines during the action scenes. 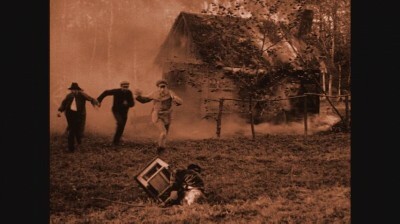 During the train chase in episode five, for example, the music makes the events unfolding on screen even more exciting and dynamic. 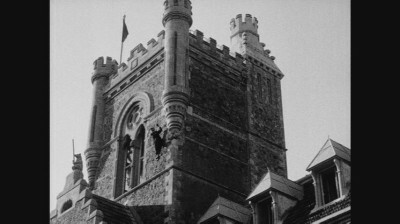 The intertitles are in the original French, and there are optional English subtitles available. The pillarboxed image looks fantastic. 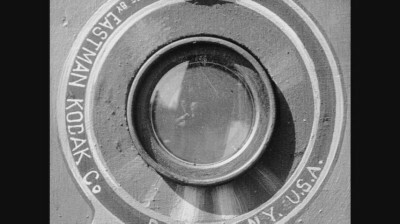 The serial was restored from the original camera negatives and scanned at 2K. The result is very impressive. The picture is clean and clear with a very good amount of detail. Contrast is excellent and the amount of print damage is very minimal. In addition there are many tinted scenes too. The only complaint that I have is that there are no opening titles and series recap at the beginning of each chapter, only at the beginning of each disc. I would have preferred to have both of these (or at least the recap) included with each installment. Included on the third disc is a nice collection of stills and production shots from the film. Packaged with the disc themselves is a 12 page booklet that gives some interesting information on the production, the stars, and the cast. If you created a Venn Diagram of movie serials and art films, the overlap would be incredibly small with the only title in the intersection being The House of Mystery. It is an exciting film that is also dramatic, creative, and very well made. This absolutely fantastic release earns our highest recommendation: DVD Talk Collector's Series.